The exhibition “Fragments. 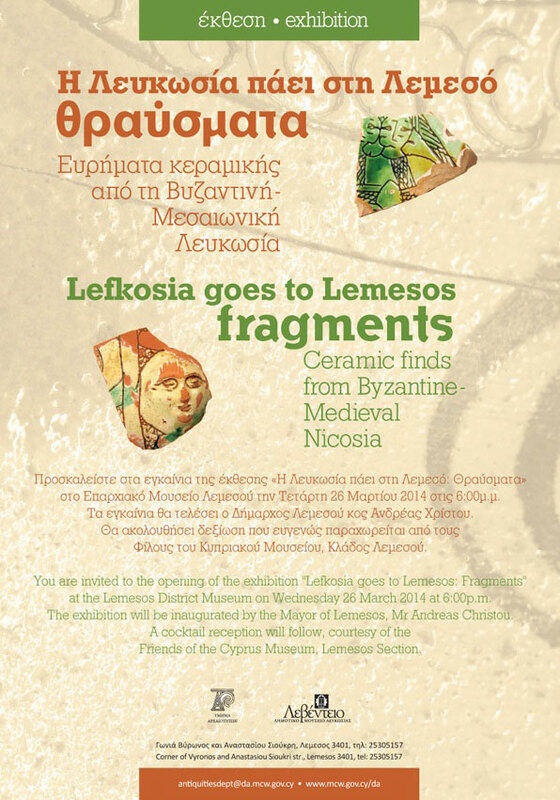 Ceramic finds from Byzantine and Medieval Nicosia” opened in March 2014 at the Lemesos District Museum. The exhibition is extended until 27 February 2015. The excavations of the last few years, both within and outside the walls of Nicosia, have considerably increased our knowledge on the topography and history of the city, which until recently depended more on written sources and traditions rather than on archaeological data. The capital of the island moved inland to Nicosia for the first time around the 10th century AD, possibly for reasons of security as well as for its location in the centre of the most fertile plain of the island. Ceramic finds from recent and older excavations, in association with accidental finds or finds from rescue excavations are exhibited here, in an attempt to trace the history of Nicosia during the Byzantine and Medieval periods. The ceramics, in combination with other evidence, provide valuable information on the city’s development during the Lusignan period and the intentional reduction of the city’s extent by the Venetians, necessitated by the new defensive system. As a result the remains of the Byzantine and Lusignan periods were seriously compromised. The ceramic fragments of glazed wares, locally made or imported, the cooking and plain wares found in the city’s quarters, monasteries and cemeteries within or on the fringes of the city, tell us its story and provide evidence for daily life, the private needs of the inhabitants, their aesthetic preferences, their religious habits, burial customs, the commercial and cultural interconnections or links and thus portray the cosmopolitan nature of the city of Nicosia.